Heat the oven to 200°C/180°C fan. Bring a medium pan of salted water to the boil and cook the sweet potato, peeled and cut into 1cm chunks, for 8 minutes, then drain and put into a large mixing bowl. Add 100g quick-cook polenta, 150g frozen sweetcorn (defrosted), spring onion, a small handful of roughly chopped oregano, 1 tbsp lightly toasted and crushed fennel seeds and a good pinch of salt and pepper. Shape the mixture into 4 patties and coat each one in a little extra polenta. Put the patties on a roasting tray, brush all over with oil, then bake in the oven for 25 minutes until golden and piping hot throughout. 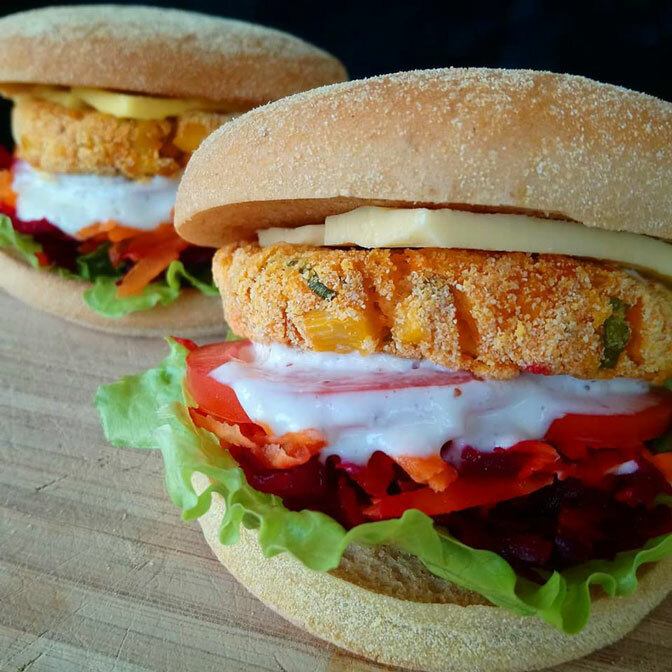 Serve in 4 toasted burger buns with sliced tomatoes, Angel Food cheddar, grated carrot & beetroot, vegan mayo, and lettuce.